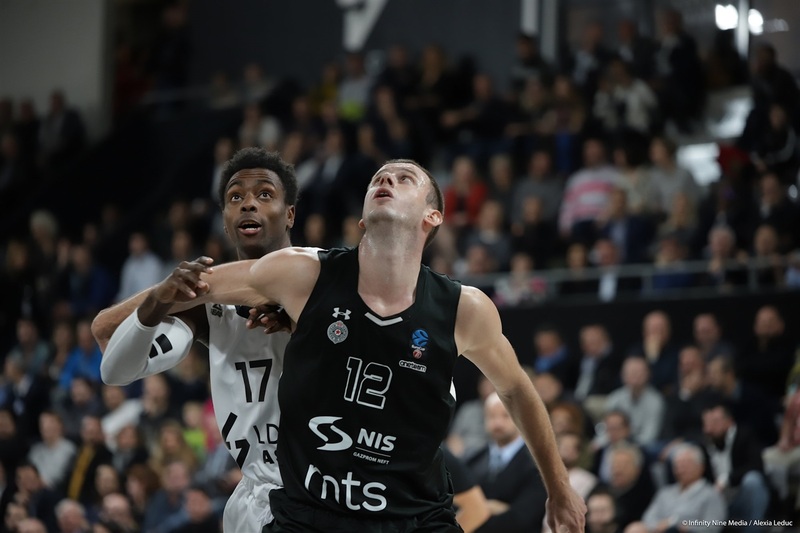 Partizan NIS Belgrade honored its never-say-die tradition by upsetting host LDLC ASVEL Villeurbanne 75-78 in a thriller on Tuesday to stay alive in Group C. Partizan improved to 3-6 and will share fifth place after Round 9 with either Turk Telekom Ankara or Dolomiti Energia Trento, who play each other on Wednesday. 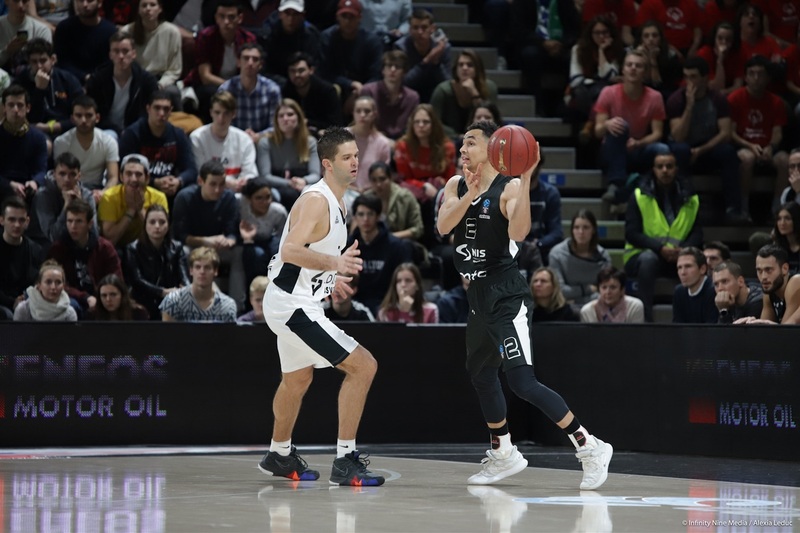 Already-advanced ASVEL fell to 6-3 and will now finish second to Valencia Basket. 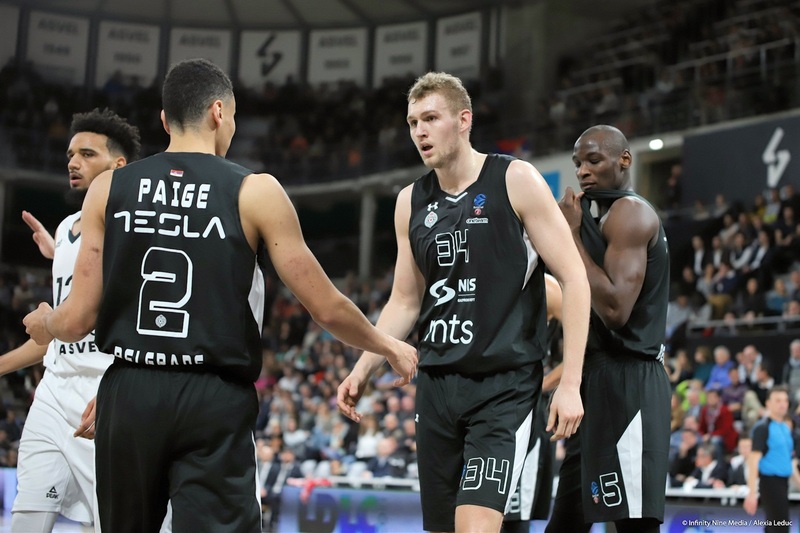 Partizan took the see-saw battle thanks to 3 consecutive baskets late by Jock Landale, who matched Aleksej Nikolic and Marcus Paige with 15 points each for the winners. Vanja Marinkovic added 11, while Djordje Gagic scored 10. Miro Bilan led ASVEL with 17 points, while Mantas Kalnietis and David Lighty added 10 each. Landale's 4 points and Paige's triple sent Partizan to an early 8-13 advantage. Livio Jean-Charles scored his first basket of the season for ASVEL to cut the difference to 12-18 after 10 minutes. 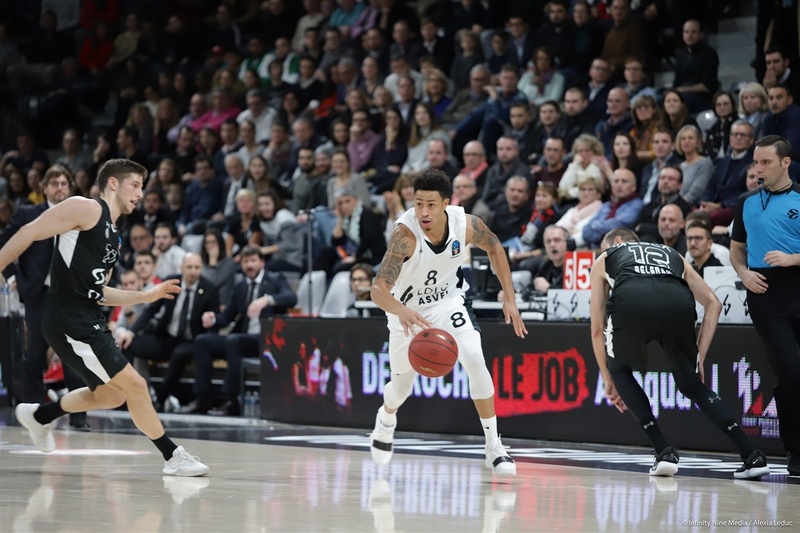 Lighty and DeMarcus Nelson got ASVEL within a point twice, but Landale answered both and kept Partizan one step ahead, 32-37, at halftime. Kalnietis buried 5 points in a row for ASVEL's first lead since the game's opening basket, 41-40. Paige mounted Partizan's resistance and Marinkovic appeared with a triple for the visitors. 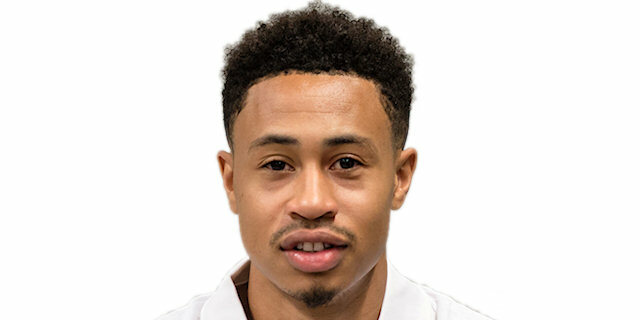 Theo Maledon went coast-to-coast before dishing to Amine Noua following a put-back by Alpha Kaba as ASVEL seized a 57-56 edge after three quarters. 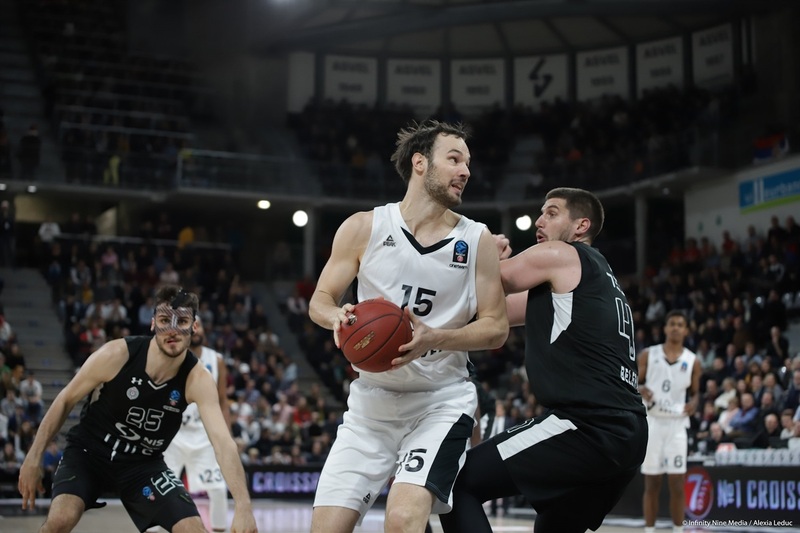 Marinkovic struck again as Partizan regained a 59-63 advantage early in the fourth. A.J. Slaughter's second-chance triple took it back for ASVEL at 67-65 with 5 minutes left. Marinkovic and Bilan flipped the scoreboard for their teams before Landale made it 69-72 with 2:30 left. He had 2 more baskets to put Partizan up 69-76, but quick steals by ASVEL and Landale's missed free throws let Bilan make it 75-76 with 17.2 seconds left. Marinkovic hit 2 of his own next and ASVEL failed to score on the last possession, sending the victory back to Belgrade. 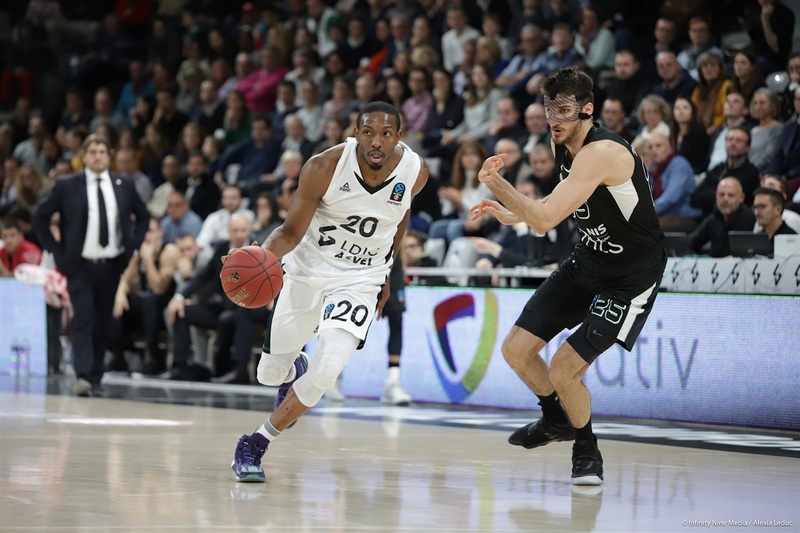 Landale completed a double-double with 10 boards as Partizan outrebounded ASVEL 37-31. That total and its 11 offensive rebounds, including 5 by Landale, matched Partizan's road averages on the glass this season and made the difference in Villeurbanne. 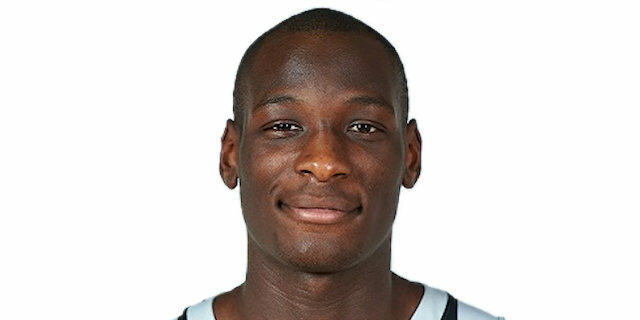 In their first games for ASVEL in this EuroCup season due to injuries, Alpha Kaba jumped center on his way to 5 rebounds, 2 blocks and a spectacular put-back dunk in 16 minutes, while power forward Livio Jean-Charles had 6 points and 4 rebounds in 13 minutes, his first EuroCup appearance since he played for ASVEL back in the 2014-15 season. Expect both to take on bigger roles going forward. 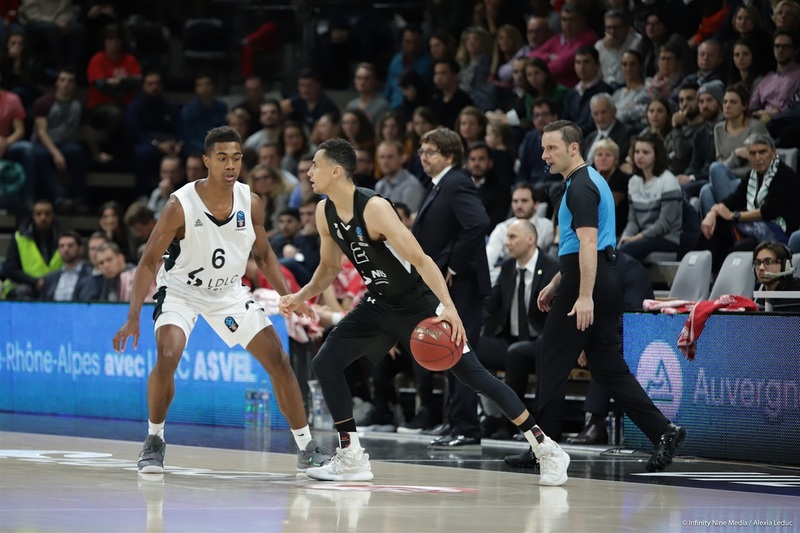 Until he exploded for all his 11 points in the game's last 13 minutes, Partizan ace Vanja Marinkovic wasn't even the game's most impressive 21-and-under player. His teammate, 20-year-old Amar Gegic, shined earlier with 4 points and a great assist. ASVEL 17-year-old Theo Maledon finished with 5 points and 6 rebounds despite just missing a coast-to-coast buzzer-beater. 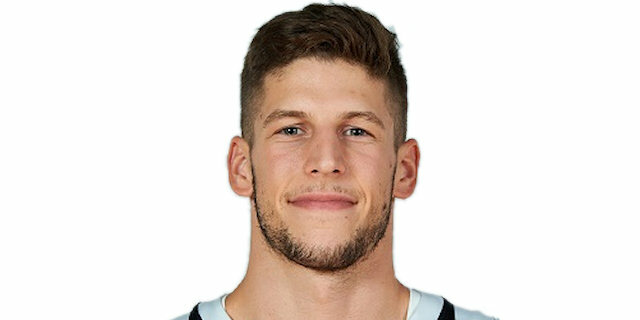 Partizan guard Aleksej Nikolic posted four career highs in the victory: 30:34 minutes played, 15 points, 16 PIR, and 4 rebounds. He also drew charges, hit key free throws and made a great move on his last basket with 3 minutes left. 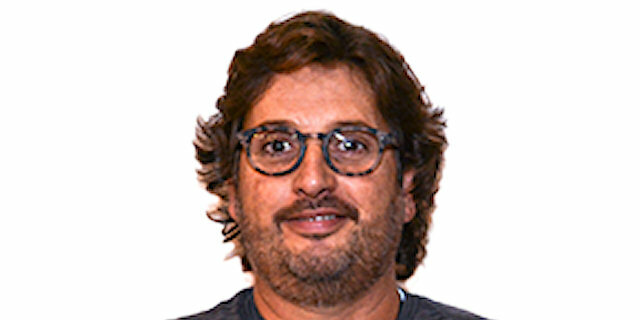 In three EuroLeague seasons under his current coach, Andrea Trinchieri, when both were with Brose Baskets Bamberg, he never played more than 26 minutes. But with Partizan's season on the line, his long-time coach trusted greatly in Nikolic. 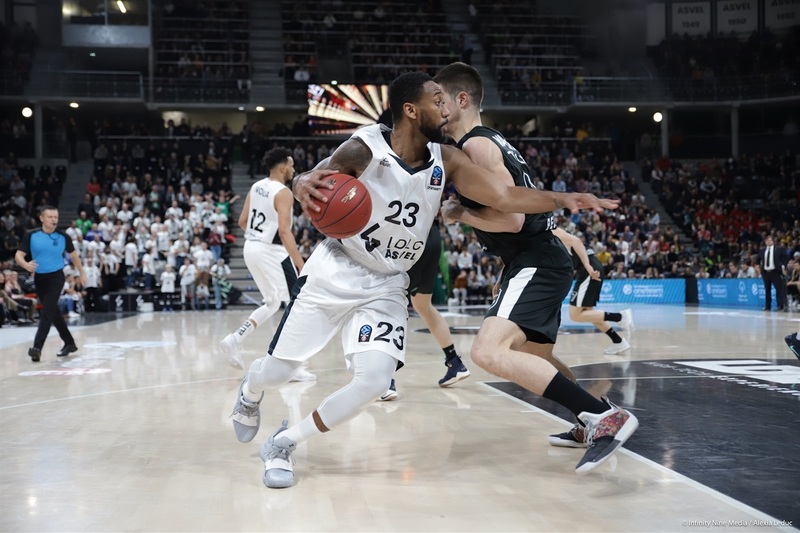 ASVEL plays on the road against Zenit St Petersburg to finish the regular season without any chance to improve or worsen its standing. 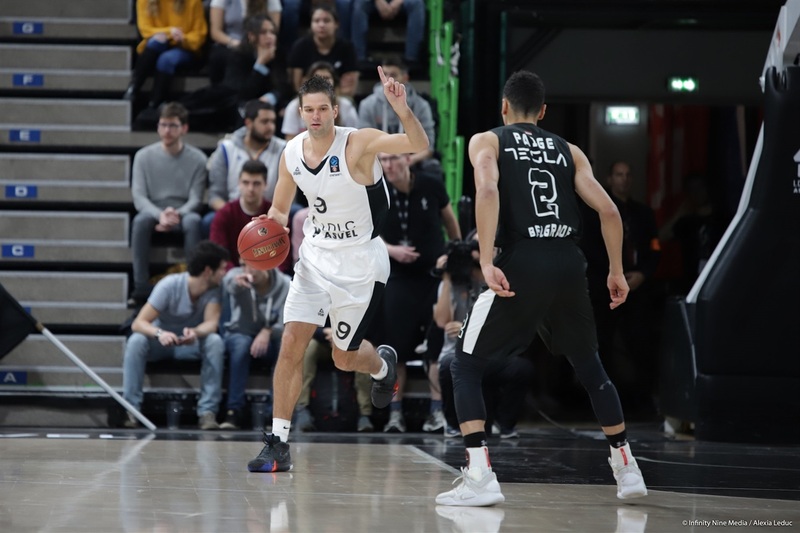 Partizan will rely on its home fans to try to take one last victory, against Turk Telekom Ankara, and perhaps clinch the Top 16 at the same time. "Yesterday we had a seven- or eight-hour trip. You could see the players without energy, especially in the first half. After, they tried to do something, but this was not our game. And thank god, this was a game for nothing, because we already finished in second place and it didn't matter. But if we didn't beat Ankara in Ankara.... You know all the EuroCup teams play [domestic games] on Saturday, sometimes Friday. We played on Sunday... We tried to win the game, we always fight. Partizan had a trip of three hours here from Belgrade yesterday, and we had a trip of seven hours yesterday. Maybe that's not the reason, but I want to protect my players. I won't say they played bad; they just played without energy. But they are human beings, not robots. I think we did a great job finishing in second place in the group, so thanks to my players, staff and the organization." "I really don't know how [we won]. We did a lot of good things, but we put everything in the garbage with low concentration, superficial plays. But at least we've got heart. We won the game, we lost the game, and we won the game again. That's a good thing for a young team like mine. It's not over til it's over." "The last minute was unbelievable, but I believe that it's more important what we did than what we didn't do. We showed great desire to win. It's extremely hard for us to play against ASVEL. They are extremely big, extremely strong, extremely physical. Game one in Belgrade was an exhibition game of their skills. The put the ball inside every time. We had great will to win tonight despite the big mistakes we made in the last minute. For us it was a survive-and-advance game because now at least we have another shot next week, hopefully. I want to thank also the Partizan fans, who were a lot coming from Switzerland and other places around here. It's always nice to play in this arena. I love to play in Astroballe, so great win for us." "We started too slowly, with no energy, especially on defense. We all knew the situation, we had to fight for this win, Belgrade fought more. Second place is a good thing. It was a bad game for us, but we put ourself in the position to finish first. We have to play together for 40 minutes to win a game like this." "It feels good to win. We had a solid game, hit some big shots in the last quarter, made some mistakes, but in the end we got the win and that's the most important thing. We showed some character on the court and that's what we'll take away." 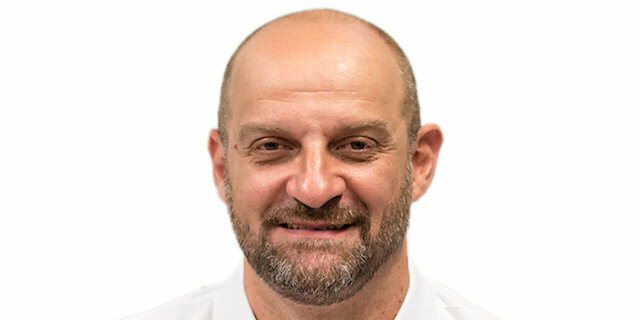 "For sure, ASVEL we know they are the most physical and probably the most aggressive team of this group. They play hard defense and very organized offense. They are a tough opponent, especially at their home. We played consistent throughout, a little bit of ups and downs in the third quarter, but we stayed mentally in the game, which was the most important thing to win in the end."